United Airlines on Wednesday announced that it will equip more than 23,000 flight attendants with Apple's iPhone 6 Plus next year, allowing them to handle onboard transactions as well as accessing company email and other internal information. Safety and service information will be available to United Airlines flight attendants with the iPhone 6 Plus, once distribution begins in the second quarter of 2015. The airline was also among the first to begin deploying iPads to pilots in the cockpit in 2011, and has renewed that plan for the iPad Air 2 this year. 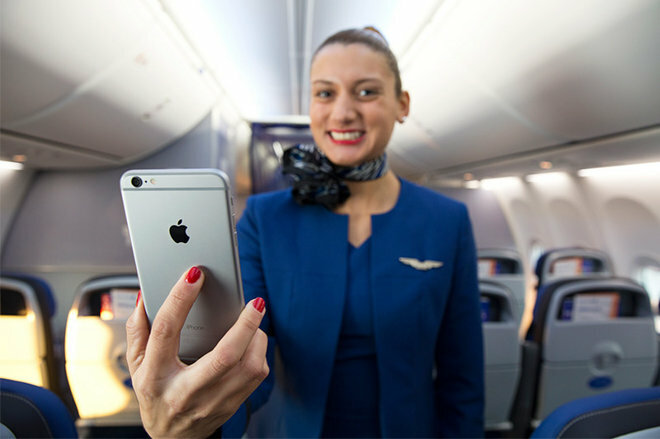 At launch, flight attendants will be able to handle most onboard retail transactions with the iPhone 6 Plus, and will also be allowed to access company email, united.com, and the company's Intranet, as well as policies and procedures manuals. United Airlines plans to expand the functions of its iPhone 6 Plus deployment over time, including replacing flight attendants' printed safety manual with an electronic version, as well as providing real-time reporting and improved follow-up on aircraft cabin issues and repairs. United is also planning to develop a number of customer-focused tools for the device. In addition to equipping its flight attendants and pilots with Apple hardware, United Airlines has also extended support to customers with iOS devices, launching an update to its official app earlier this year to provide passengers with free in-flight video content.